Stanley and Katrina von Cat the Master of Wisdom and Knowledge are celebrating their one year blogiversary (click here to read their inaugural post) by hosting their very own "Book Blasty Tour". Thank you for taking the time to visit this special stop along their tour. Updates: This book was updated in September of 2013 with a new cover, interior illustrations, and a sneak peek of book #2 in the series. 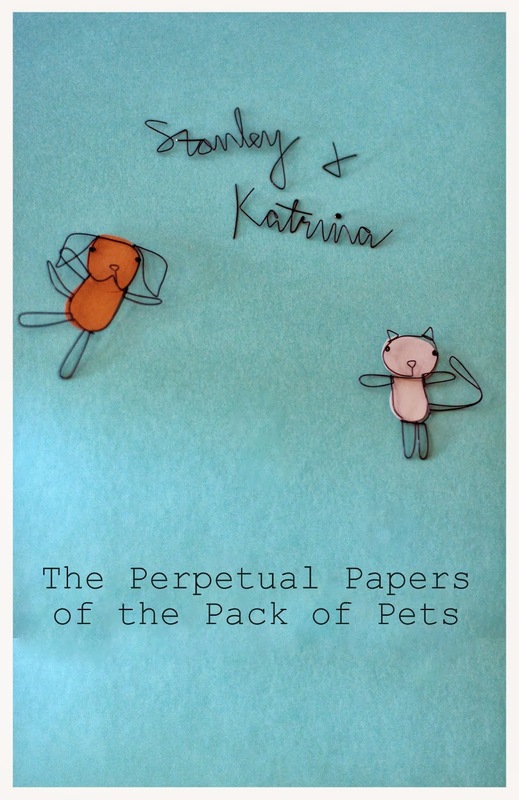 Summary (Amazon): After three years of living under the same roof as the dog in the house, Katrina von Cat the Master of Wisdom and Knowledge decides to write a letter to her canine housemate, Stanley. Katrina loves treats, naps and bossing the dog around. Stanley loves snow, attention and turkey. The diva kitty, Katrina, will have none of Stanley's antics and most certainly will not stand for him eating her food. The only reasonable solution is to take him to Kitty Court. 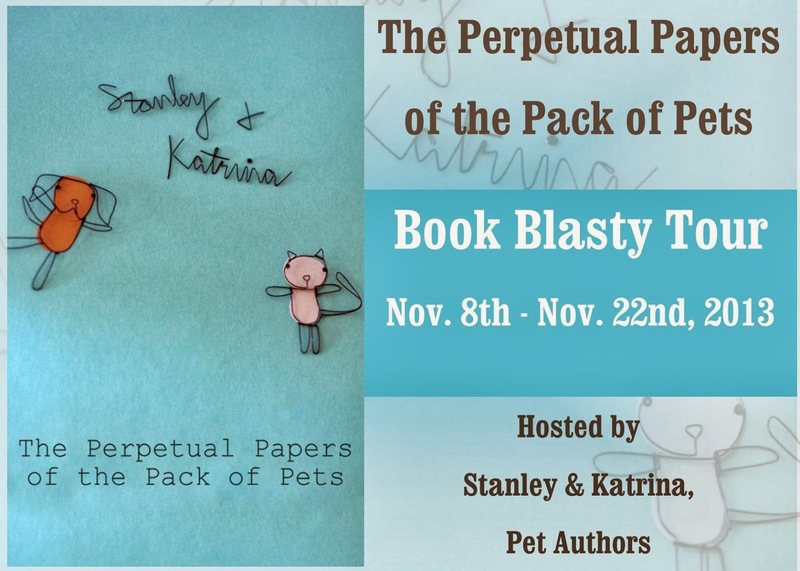 The Perpetual Papers of the Pack of Pets is a hilarious novel that follows the rambunctious lives of two pets, a cat and a dog, with a couple of other animals adding their thoughts to the mix. One can easily imagine that these are truly the thoughts of these animals. If any kid is reading this book who doesn't own a pet, then this book will help him/her to dream up imaginary ones that have lots of character. Also, this book will inspire any young reader to read as it's funny and moves quickly. The dialogue is mostly happening through a series of silly letters that are exchanged between Katrina, von Cat the Master of Wisdom and Knowledge, and Stanley, the young Labrador/Rottweiler mix. Then, to add more depth to the story, there are Narrator Segments cleverly included throughout. I like how the story is broken up in this way. The chapters are also short and sweet. Amanda's favorite part in the story was when Stanley ended one of his letters to Katrina with, "Okay, but I will still eat your food, Stanley" on page 3. She only listened to the beginning and soon lost interest as she's a bit young at age 5 for this novel. 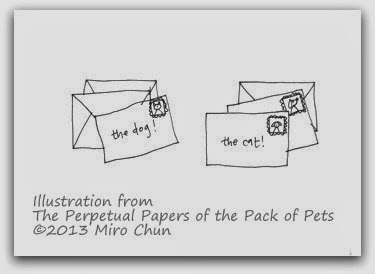 One of my favorite parts, besides what I've already mentioned, was The Pet Paper, a newspaper written by pets, on page 83.
around the ages of 6 to 10. Stanley is a three-year-old black Labrador/Rottweiler mix who does his best to ignore Katrina. 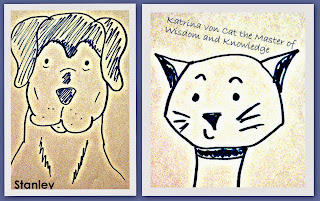 Katrina von Cat the Master of Wisdom and Knowledge is an eight-year-old grey tabby cat who loves her toy mouse.They would love to tell you where they live but all they know is that they live in a tan house. 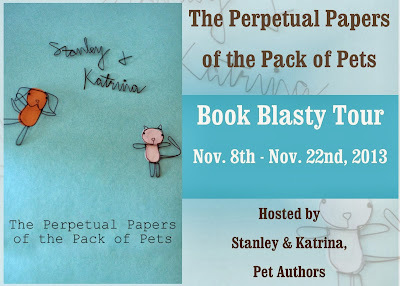 For more information about Stanley & Katrina, please visit their website, www.StanleyAndKatrina.com. Stanley & Katrina are currently offering a free 15 Minute Skype Session as a Thank You to their readers! 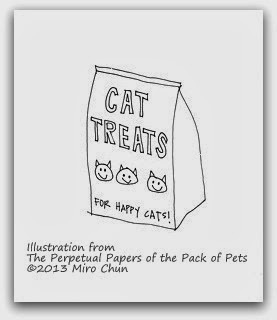 Kid Lit Printables has created fun and FREE printables for The Perpetual Papers of the Pack of Pets. Click here to view all available printables, now. How to enter: Please enter using the Rafflecopter widget above or by clicking here. Terms and Conditions: A randomly drawn winner will be contacted by email within 48 hours after the giveaway ends. The winner will have 72 hours to respond. If the winner does not respond within 72 hours, a new draw will take place for a new winner. This giveaway is in no way associated with Facebook, Twitter, Google+, Pinterest or any other entity unless otherwise specified. If you have any additional questions, feel free to send us an email at stanleyandkatrina (at) gmail (dot) com. Disclaimer: I received a free pdf copy of this book for my honest opinion, which I have given on My Review above. The Sockkids Meet Lincoln plus 6 Prizes!